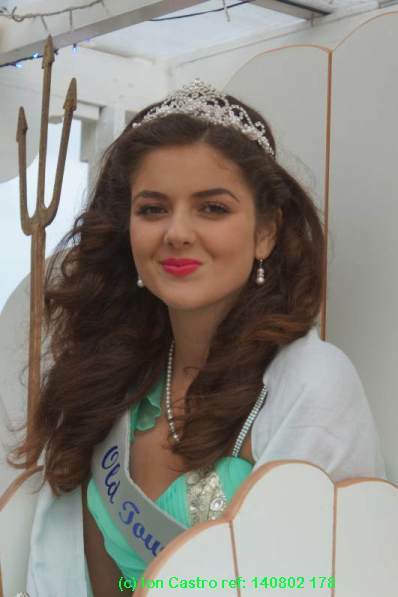 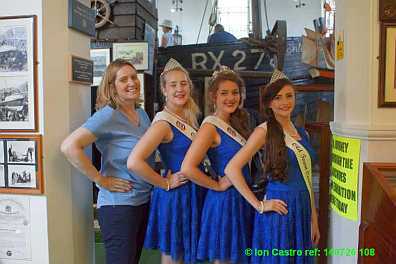 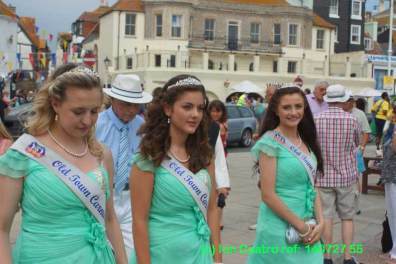 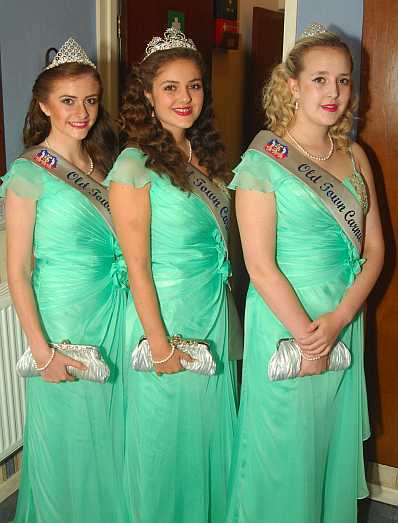 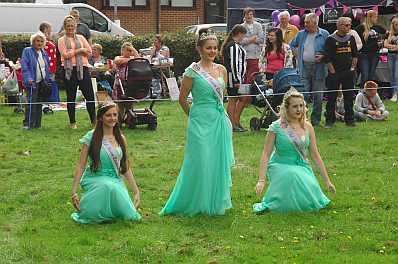 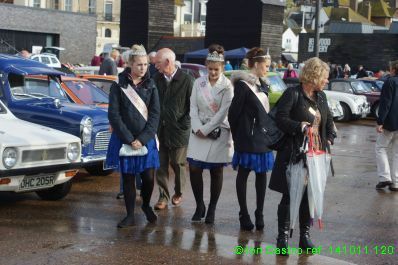 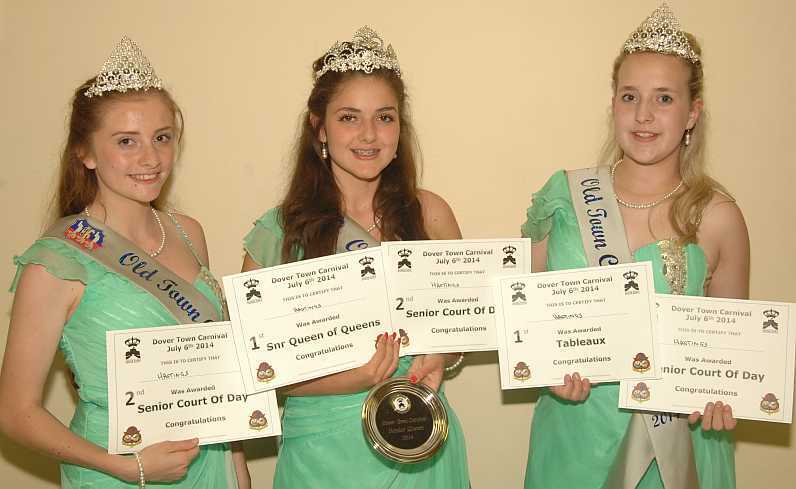 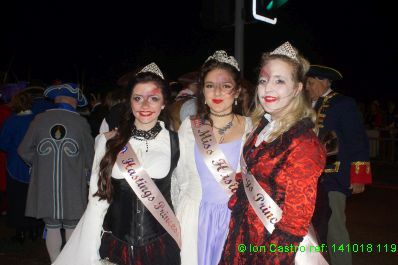 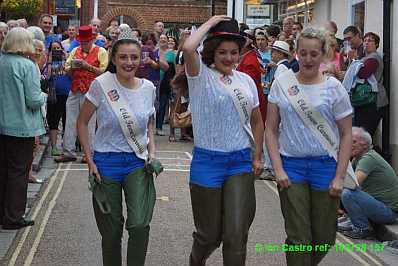 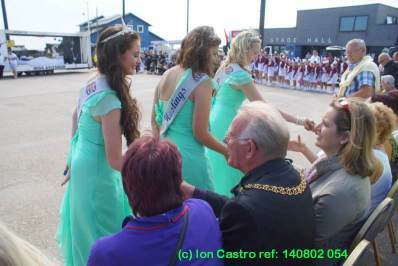 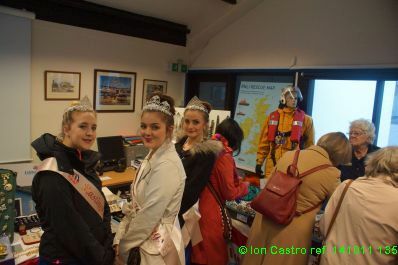 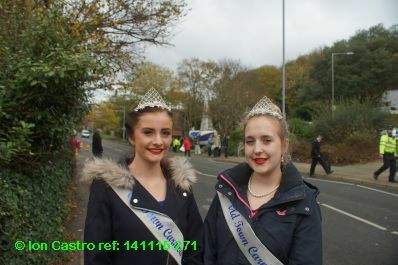 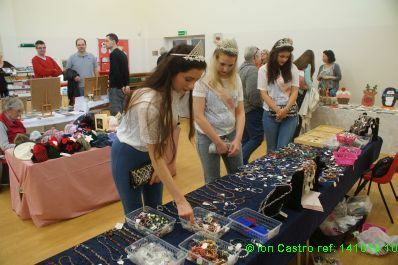 “The time that I have had with Hastings Carnival Court has been truly amazing. 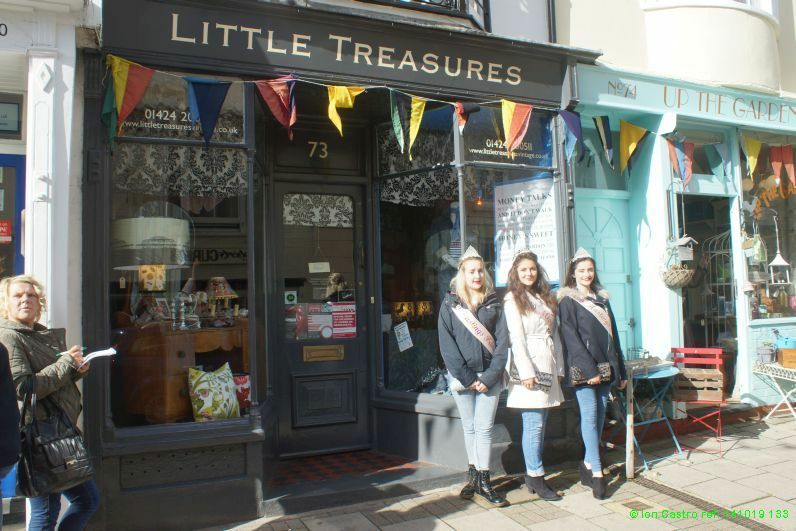 I have experienced times I will never do again, met lovely people who I still remain friends with and remember all the wonderful memories I will treasure within my life. 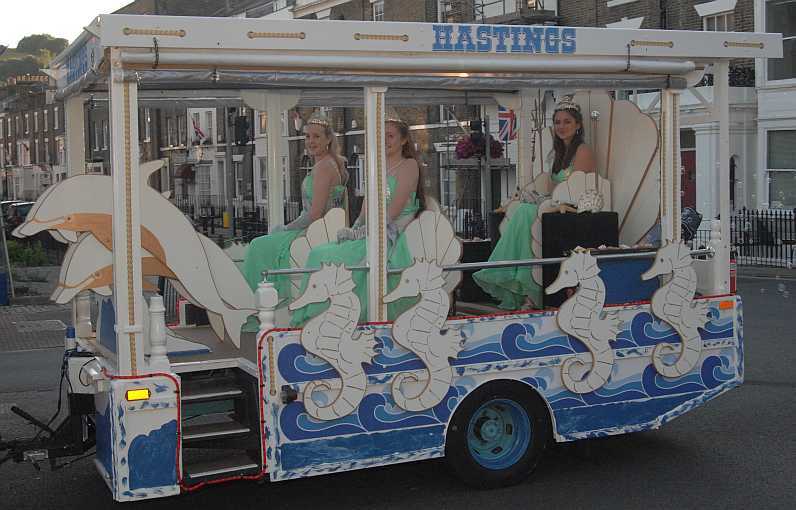 When attending events with my carnival princesses I have always felt positive and proud to be apart of representing H astings. 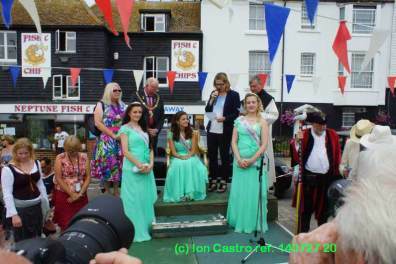 My most memorable event I will always remember was my Crowning Coronation at Winkle Island, it was such a beautiful day and the sun was shining! 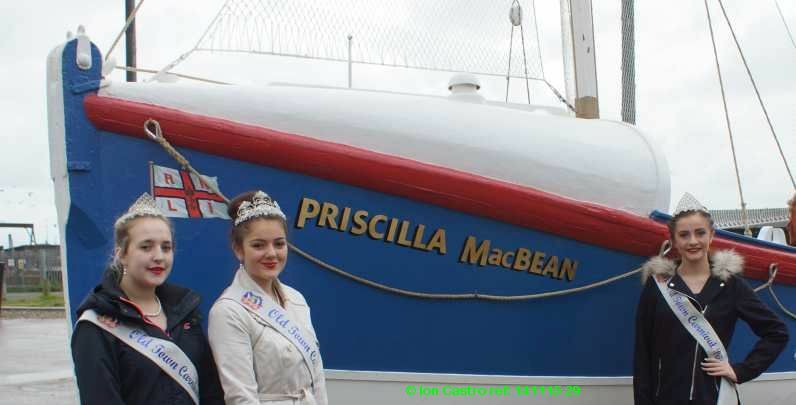 It was such an inspirational moment which will never pass..
Saturday 15th November Ancient Lifeboat the Priscilla MacBean is moved to its final 'dry dock'. 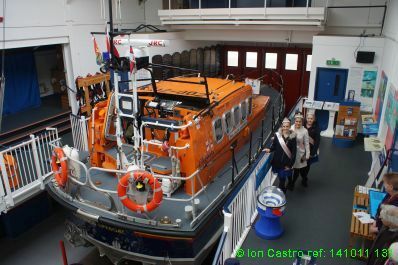 Saturday 15th November, After a year of restoration the former Eastbourne, Kirkcudbright and Maryport lifeboat is moved to its new location at the bottom of Old London Road at the top of Hastings Old Town on the 86th anniversary of the loss of sister ship, The Mary Sandford at Rye. 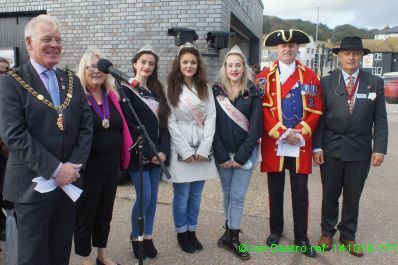 The court were amongst the VIP's that included Hastings & Rye's MP, Mayors of Rye and Hastings, Councillors, Lifeboatmen, Firemen, Hastings Bonfire, Hastings Town Crier, Hastings Old Town Crier, Coastguards, and a crew from BBC news to name but a few. 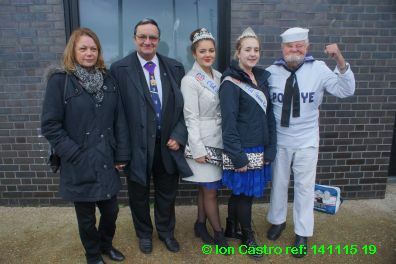 Pictures - above Priscilla MacBean waiting to be pulled, left, with Ron 'Popeye' Everett and ex mayor Alan Roberts, nelow left, taking a quick break with chaperone Sian and below - the boat in place in the background. 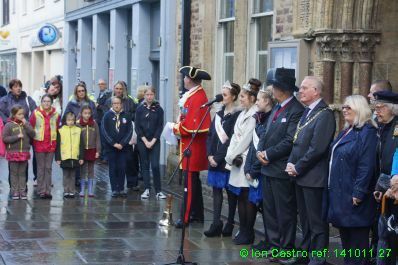 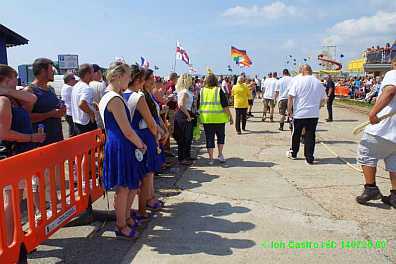 There was a good turnout for the opening ceremony despite the threatened rain with Hastings’ Mayor, cllr. 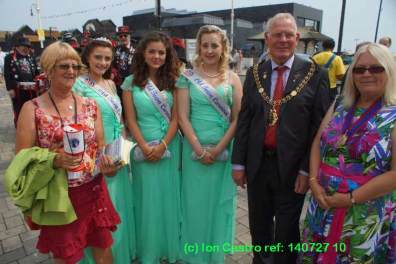 Bruce Dowling, Deputy Mayor cllr. 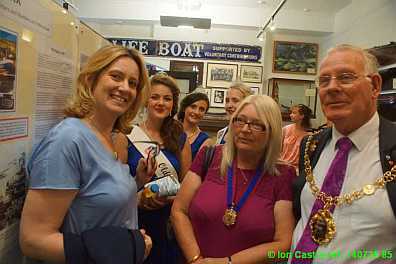 Judy Rogers, MP for Hastings & Rye, Amber Rudd Chair of the Hastings Week Committee, Nigel Hogben and members of the Committee. 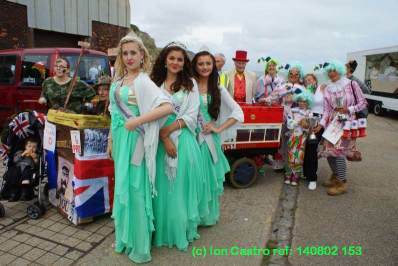 Hastings Old Town Carnival Court, British Legion and members of the cadet force, and a contingent from the Brownies in attendance. 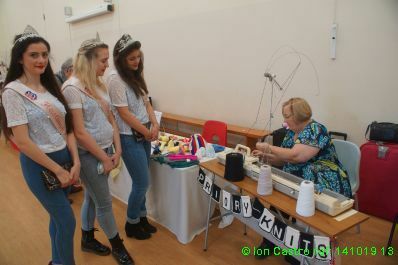 Afterwards the crowd were entertained with a song by a charming young lady from GIZMO, the young peoples’ organisation. 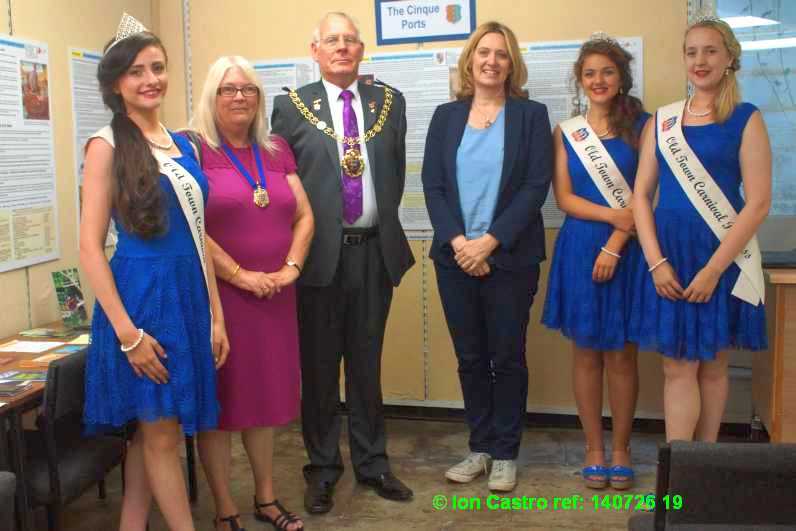 Every year since 1968 the prestigious "Order of 1066" is awarded to a deserving Hastings resident for services to the community and the presentation is attended by local VIP's, MP Amber Rudd, Mayor Bruce Dowling and Deputy Mayor Judy Rogers, Chair of the Hastings Week Committee Nigel Hogben, the Hastings Week Committee, former winners of the Order of 1066 and of course Miss Hastings and her attendants. 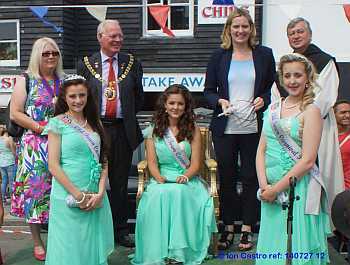 The Winner of the Order of 1066 was Owen Thompson, a resident since 1966 for services to multiculturalism. 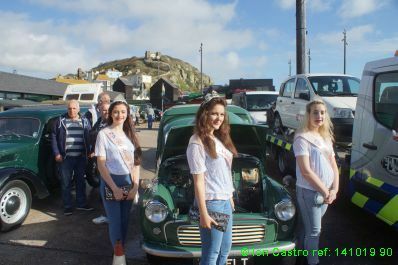 The last Sunday of Hastings Week was the 'Sprat & Winkle' - the show on the Stade exhibiting Historic Commercial Vehicles at the end of their run from Sevenoaks. 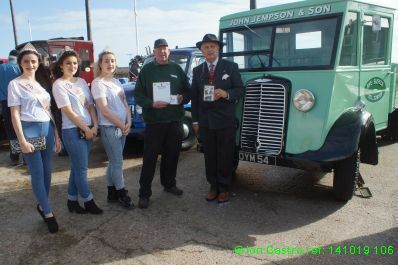 On a sadder note we would like to announce our profound sorrow at the untimely passing of Andy Garner, the main organiser of the extremely popular ‘Sprat and Winkle’ Commercial Vehicle run on the final Sunday of Hastings Week and to offer our condolences to his family and friends. 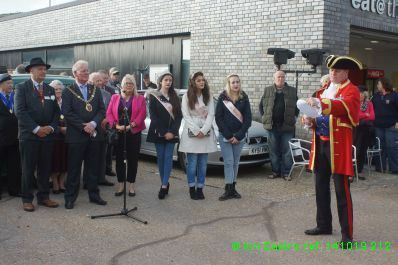 We are assured however that the event will run next year and future years in his memory. 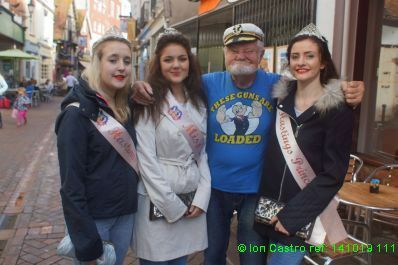 Below, left, Ron "Popeye" Everett was encountered in George Street and right, Waiting to judge the Old Town Windows. 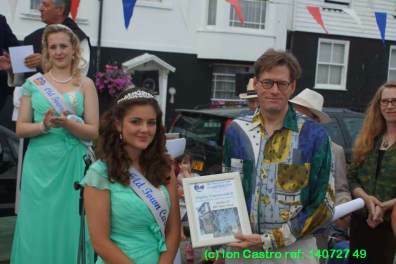 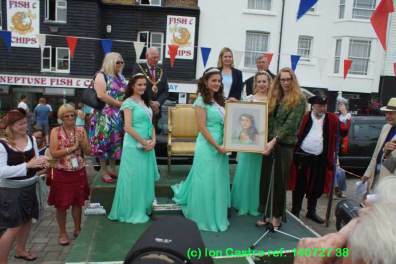 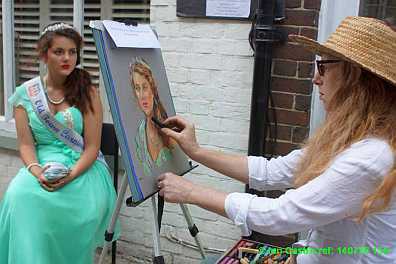 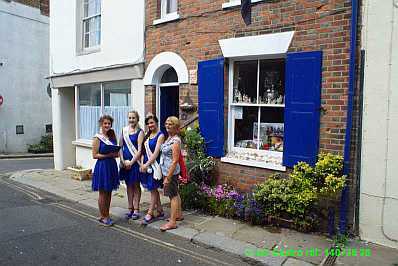 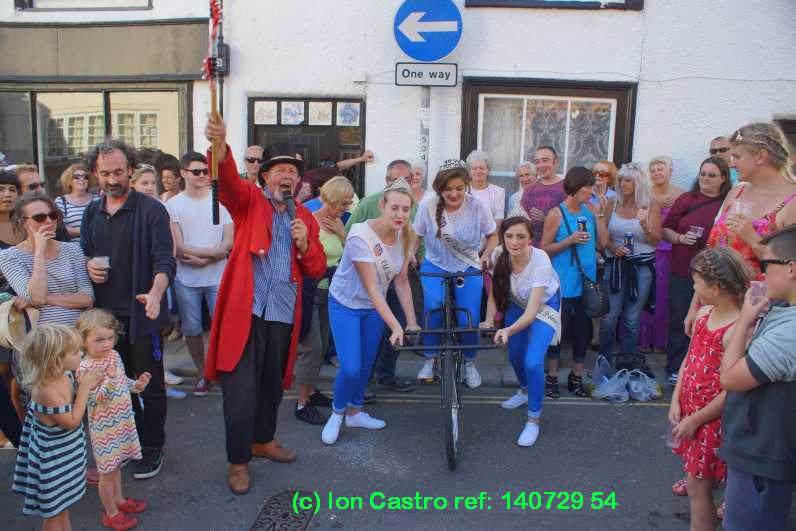 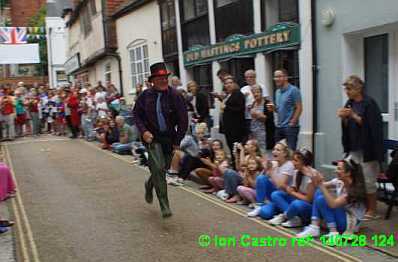 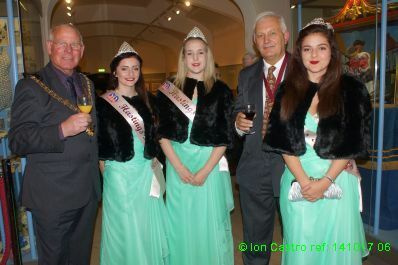 DAY 1 Saturday 26 July 2014 above From the Museum to be inroduced to the crowd by Tony Streeter at the Beach Concert, then Carnival Queen Laylah has her portrait painted by Juliette Dodd and finally taking up position in High Street to judge the Hastings Old Town Crier competition at the end of a very long day. 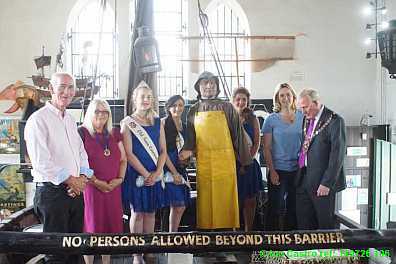 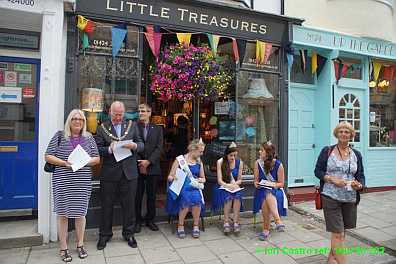 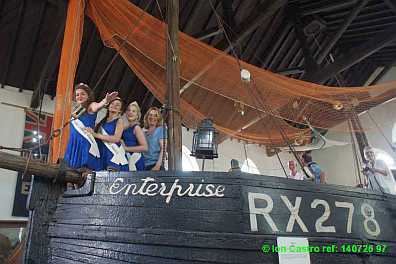 The court and Chaperone Vivienne are met on Winkle Island by the Mayor and Deputy Mayor of Hastings and then proceed to the official crowning of the Carnival Queen by MP Amber Rudd, Thsi is followed bt the Carnival Queen being presented with the portrait by Juliette Dodd The Carnival Queen then presents certificates for Best Dressed Window in All Saints Street then off with Carnival Chairman Robert Morgan for a procession round the Old Town in their new float. 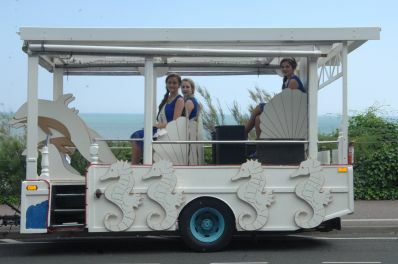 An appearance at the second day of the Beach Concert had to be cancelled because of an unfortunate change in the weather. 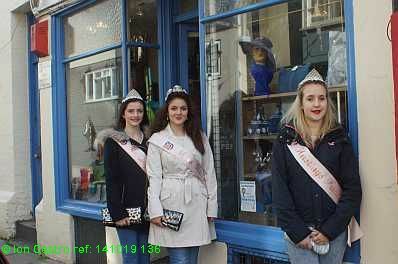 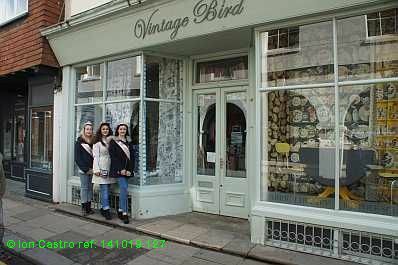 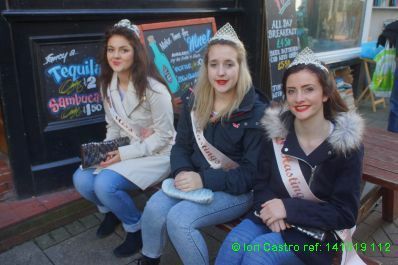 Day 5 was the Hastings Old Town Pram Race and the Carnival Court did not enter as contestants, The court did help out at the candyfloss stall as part of the High Street Party. 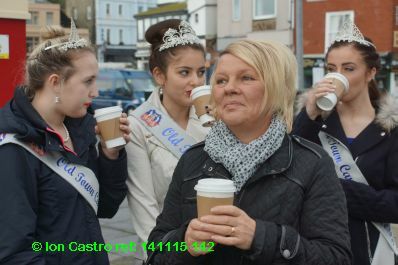 Day 7, Friday did not stage any major events for the court to attend. 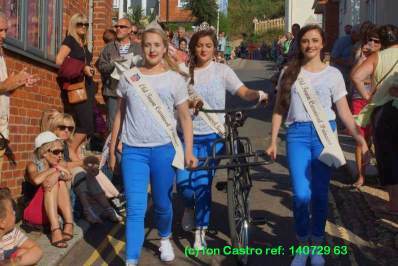 HASTINGS CARNIVAL COURT and the team enjoyed another brilliant and sunny CARNIVAL DAY at DOVER. 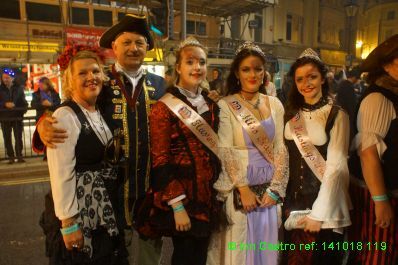 BEST VISITING COURT AND FLOAT TABLEAU. 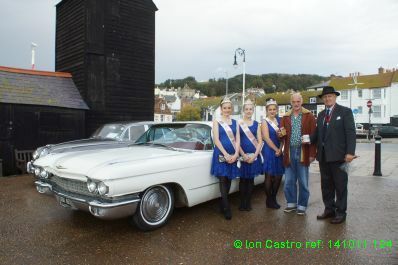 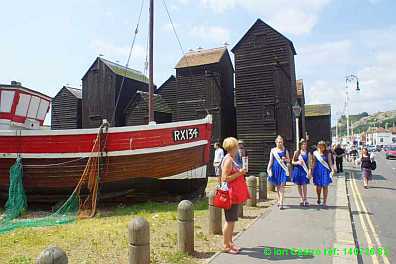 Hastings would like to say a big "THANKYOU to the DOVER TOWN COMMITTEE for a wonderful day". 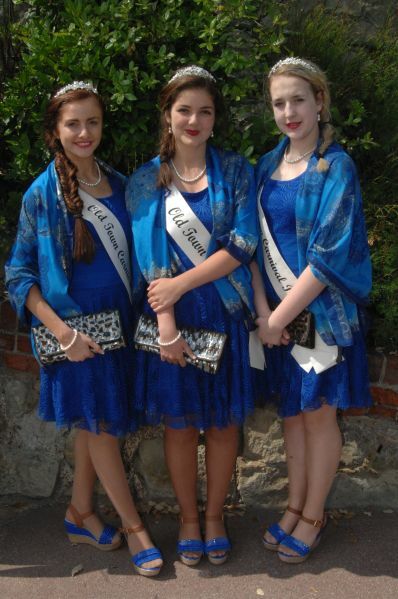 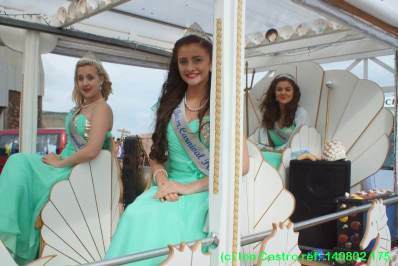 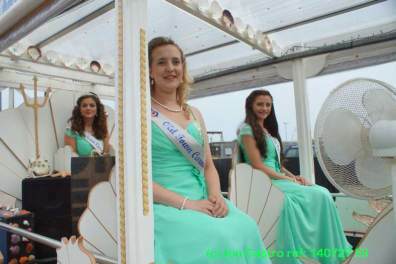 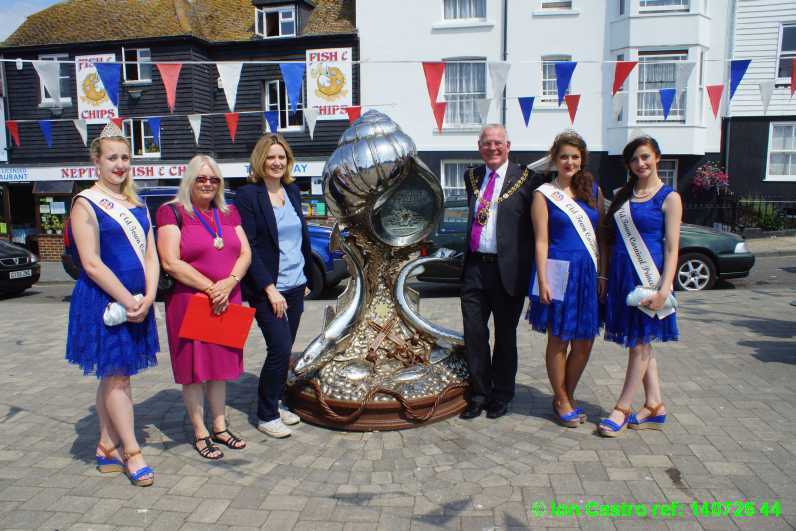 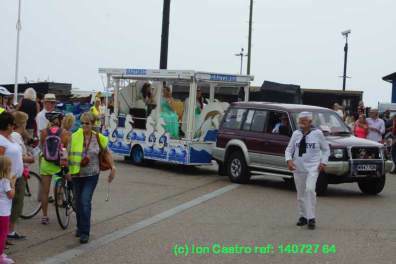 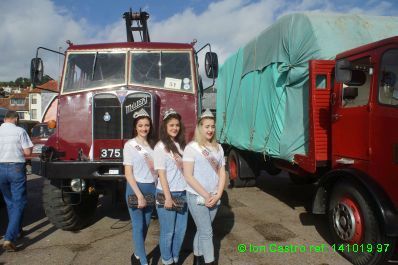 Hastings Queen Leylah Dobinson and her two Princesses, Chloe Stretton and Hannah Burgess enjoyed a huge welcome to Lydd's summer parade aboard the pristine new Hastings Carnival Court Float that first appeared at Eastbourne (see below). 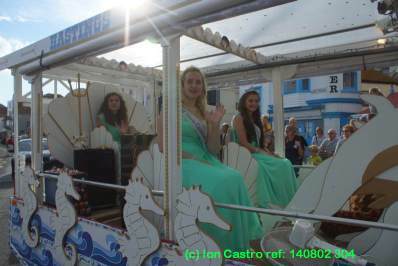 The green dresses enhanced beautifully the float decor which now portrays a 'dolphin and seahorse' seaside marine theme. 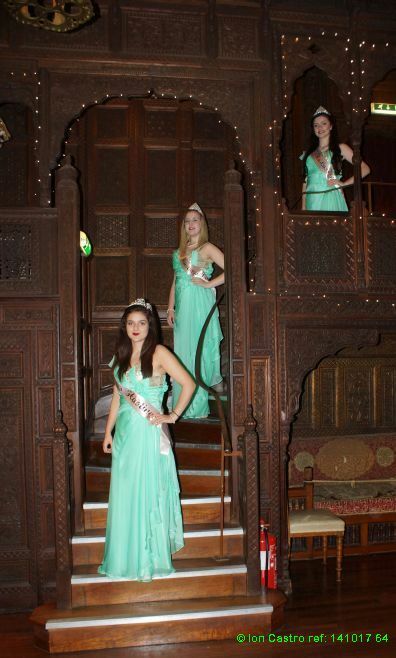 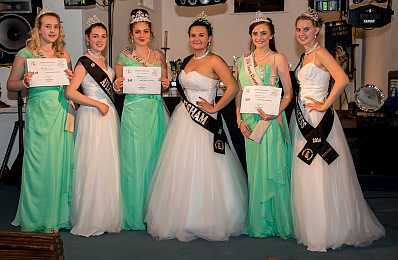 Right, Princess Chloe Stretton wins 'Teen Face of Surrey 2014' at the Addington Court Golf Clubhouse in the 'Face of the Globe Beauty Pageant' She'll be off to Disneyland Paris in October to compete for the Teen Face of the Globe 2015.